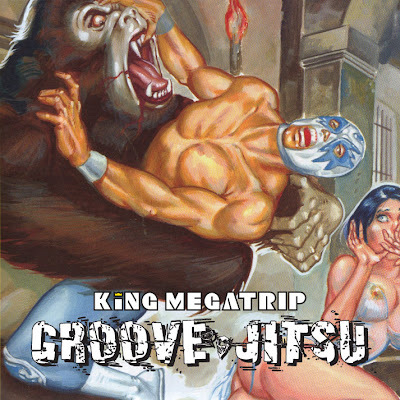 I was gonna upload a brand new BREAKS FOR DAYS RADIO show this week, but following my post a few days ago concerning the SKEME RICHARDS KUNG-FU post, the dude by the name of KING MEGATRIP (check him out at BooMBoX) hit me off with a link to his fantastic GROOVE JITSU mix - a collection of martial arts related tracks blended together with other fight themes and movie scores with a sprinkling of hip hop instrumentals. It's so damn good that I thought I would bless you all with this instead and come correct with another hour of DAILY DIGGERS goodness next week. GROOVE JITSU also features the LORDS OF PERCUSSION track I mention in my previous post. Also he drops another DAILY DIGGERS favourite by MARVIN HOLMES which I have dropped on numerous occasions when I play out. This mix is quality from start to finish, so I would like to say to KING MEGATRIP "simply excellent ... you have learned well from the lessons of the past." "I had been saving all sorts of “fight” word samples for a couple years – so I had tons and tons left unused when the mix was done – I tried to smash them all into the final bonus track. it’s quite chaotic – but fun. This mix – full of groove-jitsu technique… upper blocks, roundhouse kicks and some fantastic beats… plenty of fight related word samples rounding it all out. fetch your black belts and polish up the katanas… groove-jitsu!" So now martial arts fans, are you ready to get your guts kicked out? cool man! thanks for the blog post -- much appreciated. people who dig this mix may very well enjoy my 12 mixtape Soul Society series that I did last year. again - much gratitude... glad you enjoyed the mix! King Megatrip is THE man when it comes to them vocal samples.